The "Codex" is a module to add programmable modes to your Pila flashlight. It is available for the GL2, GL3 and GL4 models and works with either incandescent lamps or the LED dropins, luxeon or Cree. The module works regardless of the battery types used so you can still use primaries or rechargeables. The Pila LED tailcaps can't be used with the Codex module, it only works with the tactical clickie switch. The codex is installed between the bezel and the battery tube. It has 4 programs "a,b,c,d" that you can modify. Each program consists of a series of frames (up to 9 frames per program). Each frame defines a brightness level (0%,25%,50%,75%,99%) and a duration (from 0.0 to 9.9 seconds). When the program is activated frames are run in sequence re-starting with the first frame after the last one is played. So for example a strobe is a 0.1 second 99% frame followed by a 0.1 seconds 0% frame. A locator beacon can be a 25% 0.1 seconds frame followed by a 0% 9.9 seconds frame. Etc. There is a built-in SOS mode that doesn't take a program and can be used at any time. There is also a "bypass" mode that means "no program" to use the light at 100% brightness. After programming you can cycle through programs and bypass mode clicking the button in the codex module. The codex also adds a battery indicator and automatically dims the light if the battery is low to preserve runtime. The module also remembers the last program used and turns on in that program the next time the light is used. We found the codex very interesting but very limited for its size and price, 4 programs are not enough if you want 4 brightness levels you can't have any other programs strobes anything. The programming is also limited forcing you to create repeating sequences, many ideas we had in mind like a light to read at camping that auto turns off after a few hours or keeps blinking in beacon mode are not possible. The self-start test that makes the light blink destroys momentary operation and the 99% flash is annoying specially if you wanted to start the light in a low brightness mode. So the idea is brilliant the execution has some flaws. You can read more and order ($73 for the GL2) from JSBurlys Flashlights. The cash can is a novelty container designed to keep some cash for emergencies. 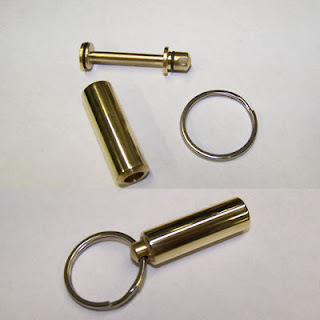 The capsule is 1 1/2 Inches Long built in solid brass with a small bar inside. This cool little cash keeper is for just one bill, which is to be folded in thirds, then rolled around the center bar. The center bar with the note is then inserted in the container and through a hole in the top. Then a split ring ot a clip goes through the hole in the bar the bar then can't be removed from the container as long as the splitring or clip is blocking the hole. Very clever solution and very practical, o-rings at the bottom of the container make it water-proof. You can use it to keep some emergency cash in your keychain, or as a very elegant gift. The design is also practical to store a mini roll of duct tape cut to fit the inner bar or some nylon thread. We believe a removable ring makes more sense than a split ring in some uses to be able to quickly access the contents without removing the split ring. We really liked this product either to keep some cash, some duct tape or as a gift, it is small, sleek and works great. Our strongest recomendation is that ordering one is not going to be enough. You can read more and order for $13 from Sunshine products.